Symphonic Band is an instrumental group comprising the marching and symphonic band styles of performance. This full-year course is open by audition/director invitation only to a limited number of students in grades 10-12. The marching band component includes summer band camp; field practice for performances at football games, marching shows, marching for parades and performance involvement within the local community. 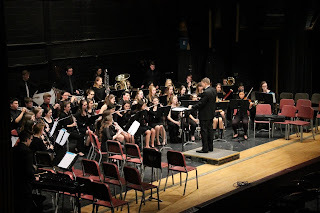 The symphonic band component includes after-school/occasional nightly sectional rehearsals as well as performances at public, department and school presentations. Students are expected to participate in all of these activities. Fundamentals of Musicianship (951) is highly recommended. This is an ensemble for serious musicians who are expected to practice a minimum of 3 hours a week. Students in this ensemble are highly encouraged to take private lessons on their instrument outside of school. Instrumentation for this ensemble will be limited to approximately 60 seats: 8 flutes, 8-9 clarinets, 1-2 bass clarinets, 1-2 oboes, 1-2 bassoons, 4 alto saxes, 2 tenor saxes, 1 bari sax, 4 horns, 9-10 trumpets, 6 trombones, 2 euphoniums, 2 tubas, and 6-8 percussionists. Students will be expected to perform literature at an advanced difficulty level. Auditions for acceptance into symphonic band will be held each year in early February.